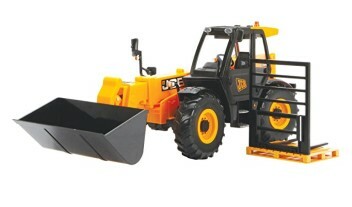 * Take on any heavy-duty landscaping job with the Britains Big Farm JCB 550-80 Loadall and its giant bucket! * The Loadall's extendable arm can be raised and lowered, with the bucket able to tilt backwards and forwards. * The bucket is interchangeable and can be swapped for pallet forks to lift the included pallet. * Features working steering wheel, lights and realistic engine sounds.